JOHK had a good signal one October evening. QSL card received today. SDR development has been somewhat incremental the past decade. The Perseus (2007) is still the SDR of choice for many DX-ers. Size hasn't changed significantly in this period. Neither has large signal handling, but there has been some development on maximum sampling rates, with the Elad FDM-S2 leading the way with a 6 MHz maximum bandwidth. Size: The Expert Electronics ColibriNANO is the size of a simple 8-bit dongle, yet has a 14-bit ADC like the Perseus, and can sample up to 3 MHz. Its frequency range is 0-55 MHz, up to 500 MHz with undersampling. As per the end of May, some preorder units have been delivered to customers, others (me) are still waiting. EUR 299. Performance: The Airspy HF+ claims to be a paradigm shift in high performance HF radio design with superb signal rejection and stunning sensitivity claims (MDS of -138 dBm!). Frequency coverage is 0-31 MHz and 60-260 MHz. The architechture only permits a sampling rate of 660 kHz though. As per the end of May, the HF+ is not announced for sale. so we do not really know if it will happen during the summer. Price? TBA. I've seen mentions of a "target price" of < USD 200, but not from Airspy. Their current top model, the Airspy R2 + Spyverter (needed for performance below 24 MHz), costs EUR 289. My unqualified guess is EUR 299. Capacity: The Elad FDM-S3 (sorry, I have no links to the actual SDR but I found the photo below on the internet) takes RF recording for the hobby market to an entirely new level with the possibility to sample 24 MHz! This will make FM DX-ers happy. I've read that it will cover 0-54 MHz and 76-108 MHz. As per the end of May no announcement of availability. It was shown on the Dayton Hamvention. Price TBA. My unqualified guess is EUR 899. The S2 sells for EUR 525. 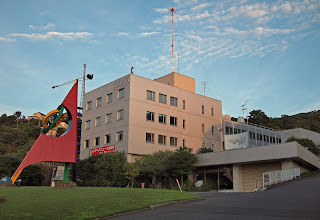 RKB's main station JOFR in Fukuoka is among the strongest Japanese stations here. JOFO is a 1-kW relay and was fighting with Kumamoto Hoso (RKK) at the time, but with a good signal. QSL card, letter and schedules received today. JOHR Sapporo 1287 is among the most common Japanese stations here, and with the potential of absolutely "local" signal levels at times. There are still more stations in the HBC network to report, such as 801, 900, 1098 and 1494 kHz. We'll see what the coming season brings. Not too often heard because of high-powered competition on the frequency. I caught a very good signal in February though, and received a response today with a form letter, QSL, pen and lots of other promotional material. Next season's targets will be NBC's lower-powered relays on 1098 and 1458. An old reception which responded with a QSL card. There are several low-powered relay stations which are possible to hear, and a report has just been sent for two 100-watt relays on 1584. 1395 is a 1 kW relay of JOCR Kobe 558, and was heard on September 19. 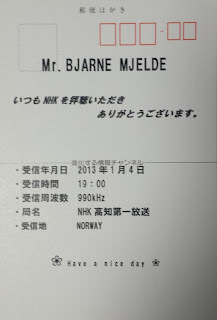 They sent their QSL card and time table (as most Japanese stations do). Many years ago I tried to confirm their main station JOCR, but with no luck. During last august I did hear JOCR several times, but a clear ID avoided me, and HLQH with their 250 kW was very dominant. Next time...! 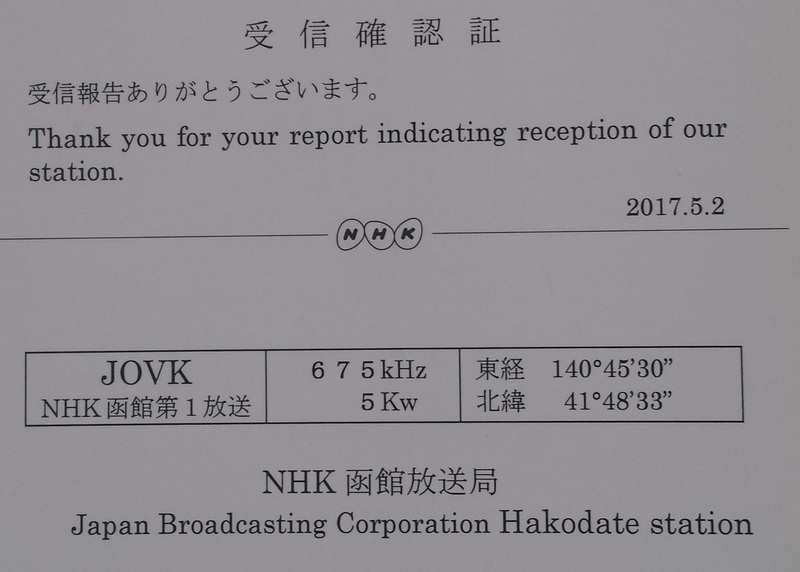 5 kW JOIQ is heard from time to time, and a good signal ID from October 2017 was confirmed with a letter from the Muroran, Hokkaido office. 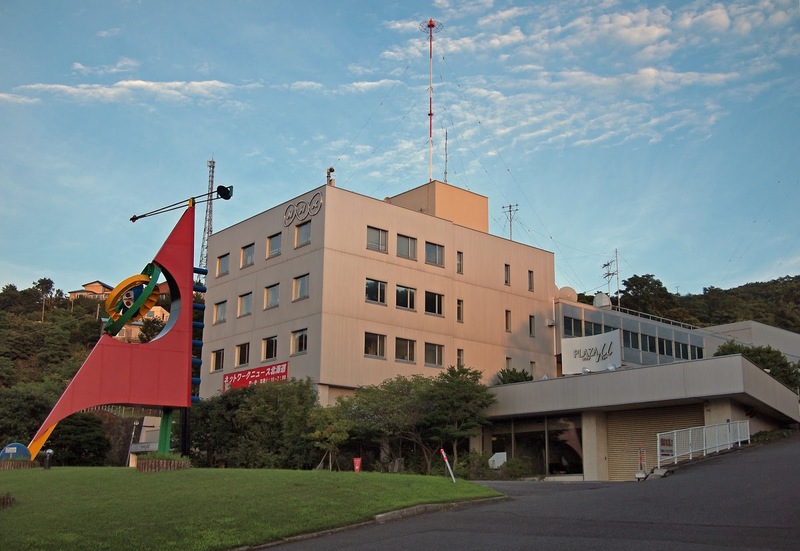 Unlike many other NHK offices, they have no QSL card of their own. 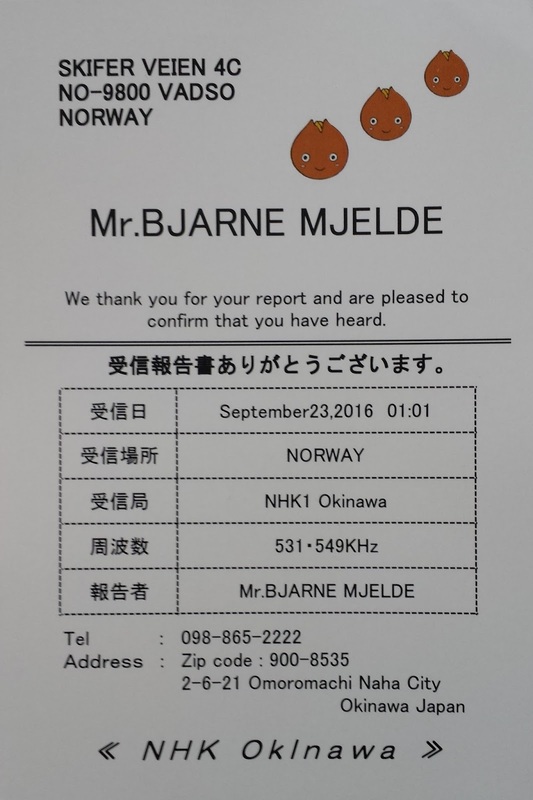 The engineers at Yamagata Hoso are quite surprised to have received "several reports from Norway in the past". My reception was from late October 2016, but YBC has had a steady signal on 918 and might expect more reports. 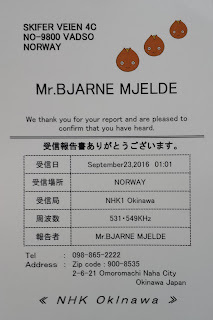 JONF had a nice signal on October 11, and sent a friendly letter and QSL card in response for my report. Heard last September with a fair signal, QSL received today. Another one heard around autumn equinox last year with local identification. Heard in September 2016, I received a QSL card and a friendly letter from one of the tech guys today. A strong and clear "ABS Radio" on 936 kHz last October was sent to Akita a couple of weeks ago. QSL card including the standard Japanese "TNX FR UR RPT", just like their HAM QSLs, received today. Last year I wrote some initial impressions after a couple of weeks of using the KiwiSDR. 8 months later I thought it was time to reflect further about the hardware, the software and its potential. So, my Second Thoughts are available for those who are curious about this rather unusual SDR. Did I have second thoughts? Nooo... just a pun. "The Dove" was heard several times the last season. After a few tries I received a friendly email today. Attached were two of the liners they used (one of which was on the recording I sent to them). Thanks Bo Olofsson for v/s. Minami Nihon Hoso, or MBC as they also ID, has 20 kW on 1107 so quite easy to hear. QSL and letter received yesterday. A standard QSL card was in the mail today for a September, 2019 reception. Since I have 1485 from many years back, I only need 918 to have the Yamaguchi Hoso network confirmed. Japan #75 on MW. Excellent conditions towards Okinawa brought these two NHK-1 Okinawa stations. The Gabu, 531 station is only 1 kW. 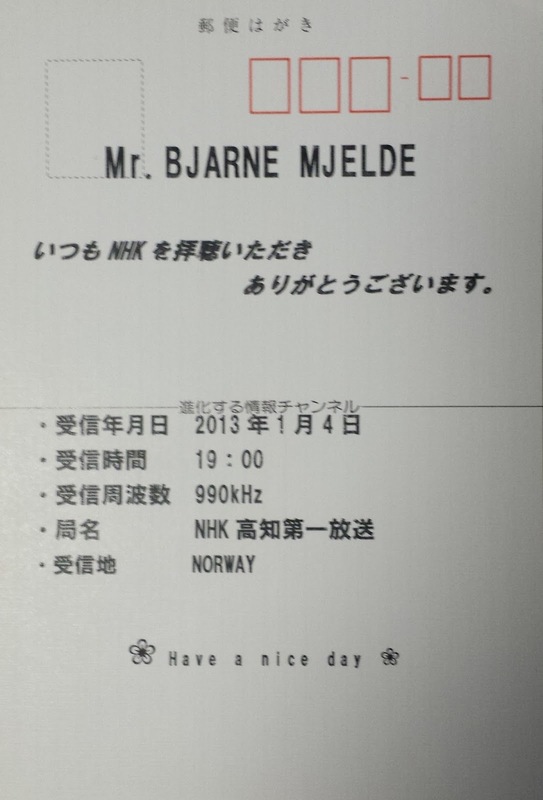 Oddly enough, they gave their local ID at 16:01 UTC, and closed down, contrary to other NHK-1 stations. Thanks Ole Forr for spotting this. A friendly letter accompanied the QSL card. Their NHK-2 station on 1125 is already in my collection. Some time ago I had a good ID on the otherwise cluttered frequency 990. Today I received a QSL card with a short but friendly letter including lots of photos from the station, such as studios, the two 10 kW transmitters and the 90-meter tower. And a sushi dish! 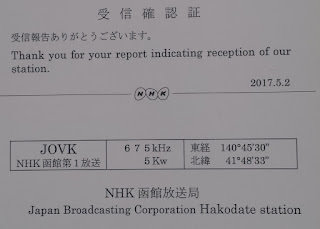 Ages ago I received a QSL for their NHK-2 station on 1152.